Much has changed since the beginning of this decade for many people, if ever there was an inadequately obvious opening sentence this was probably it and it was written to preface a topic that will be scorned upon should anyone read this piece. Today something I’ve thoroughly enjoyed for ten years concluded and I was momentarily choked up at the prospect. Completing the mission has ended my solo experience with the anguish, challenge, characters and the environments of Halo: Reach the video game series. As I write, the soundtrack is playing on loop in the background and it feels rather like I’m peering back to a tiny planet as I’m whisked away in an escape pod. For those that don’t play video games, try imaging your favorite movie, TV or book series has ended and with it the place you used to escape to has closed. Imagine being the longstanding lead actor in the final episode of Lost, or Days of Our Lives or Harry Potter. The Halo video game series offered casual gamers, that include myself and a few of my closest friends, an opportunity to take part in what’s known as a first person shooter, a game where you take on the role of the lead protagonist fighting to save earth from invading aliens. Halo was also the first game on the Microsoft Xbox game console and offered the visual perspective of seeing the world through virtual eyes, not over the shoulder or from above, and this immersed us in our universe defending role. With that previous paragraph I’ve stripped away all the texture that created the experience and can now see it was a collection of stunning landscapes, camaraderie with my now departed alien and human contemporaries, beautiful soundtracks and earth has been saved. It shouldn’t be but is a strange sensation to feel an emotion for a video game, beyond frustration for difficult to complete gaming experiences, and makes me question why I feel almost embarrassed for really enjoying the video game. Perhaps it’s the stigma attached to video games being childish and only as an escape or perhaps… considering tomorrow marks the 36 anniversary of my birth I should really have grown out of them. Earlier today during a conversation with a friend about my guilt for feeling an emotion about a video game, we realized that it wasn’t just a game played by murderous 12 year olds looking for cannon fodder and there are plenty of those. Halo represented an opportunity to escape from everyday adult lives and be heroic albeit in our living rooms at 4am on a week night. 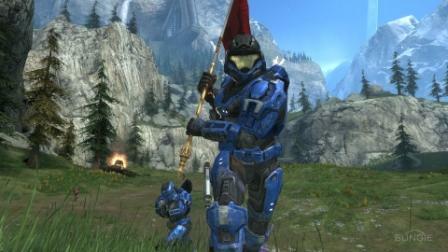 In retrospect the ten hours I put into completing Halo Reach were hours I wish had passed more slowly. Sure I can play it again, and there’s countless hours of multiplayer action to be had with people from all around the world online but the story is over for me and I feel/felt a little emotion. The end. I will not be ashamed. Much. Instead I’ll turn this into a thank you and compliment the Bungie team for a job well done for leaving me thoroughly entertained for the hours, days and nights I’ve poured into a video game. Update: As I was looking for a suitable image to show you the landscapes I stumbled upon an announcement from Bungie that in its first week alone more than 70 million games of Halo: Reach have been played. That’s quite an audience.